What is the Walk of the Nations? The Walk of the Nations was created as a legacy to the 2008 North American Indigenous Games (NAIG) which saw our First Nations and non-First Nations communities come together in new and profound ways. 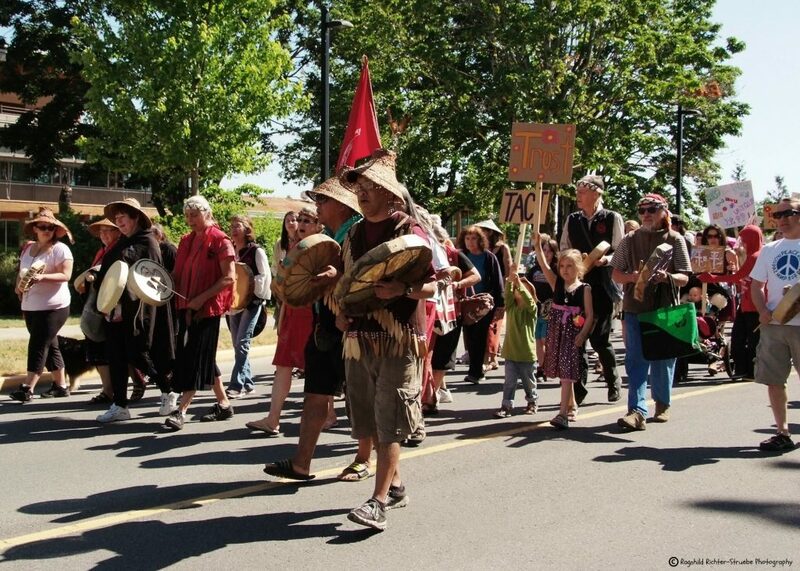 Similar to the 2008 NAIG, the Walk of the Nations is an opportunity for everyone to come together and celebrate the rich diversity of the Cowichan Region. The event features a symbolic walk of Understanding, Acceptance, Respect and Compassion through downtown Duncan and following the walk – join us for a free community celebration with food, cultural performances and musical entertainment! How did the Walk of the Nations come to CIS? In 2011, the organizing committee collaborated with CIS, who were celebrating their 30th Anniversary of supporting immigrants and refugees as well as working to build welcoming and inclusive communities. This partnership resulted in one of the best events to date and showcased the cultural diversity of our First Nations and our Immigrant communities. This collaboration has been formalized and CIS is the new home of the Walk of the Nations project! The organizing committee decided to move the event from October to June to coincide with National Aboriginal Month. Also, moving the event to June allows us to work more closely with schools in order to engage students throughout the school year. The warm weather in June will certainly be a pleasant change as well! Win a school spirit award! The School Spirit Award was created in 2010 as a way to engage elementary school students in exploring the meaning of the Walk of the Nations, and to encourage student, staff and family participation at the event. The Award goes to the elementary school demonstrating the most School Spirit. The winning school becomes the holder of the Spirit Drum (Walk of the Nations logo handpainted by Cowichan artist Maynard Johnny Jr), and chooses one representative to carry the drum and walk at a place of distinction in the following year’s parade. The award also comes with a $500 cash prize (sponsored by Rock Steady Restorations). In 2010 and 2011, the School Spirit Award went to Alexander and Bench Elementary Schools. On their own initiative, Bench Elementary School planned a wonderful ‘handover ceremony’ which featured drumming, singing and dancing by First Nations students inviting participation of non-First Nations students through the Friendship Dance. This year, the organizing committee has decided to add a category for Middle/Secondary Schools. This School Spirit Award will go to the middle/secondary school that demonstrates the most school spirit. Some ways that middle/secondary schools can demonstrate their spirit are: creating a school or community project that includes the core themes of: Understanding, Acceptance, Respect and Compassion; promoting the Walk of the Nations event and core values; and by showing up on June 1 with their school banner and as many students, staff and families as possible. We are happy to annouce that the 2013 School Spirit Award went to Queen of Angels School! The CIS Challenge goes out to all community non-profit organizations, youth groups, service clubs and local businesses. The challenge is an opportunity for participating organizations, groups, clubs and businesses to show their support of inclusive communities by bringing staff, board, membership, the people they serve and their families to the 5th Annual Walk of the Nations. Registration for the CIS Challenge is free and participants simply show up with their banner and as many people as possible. This is an excellent way to showcase their contribution to building an inclusive community. Participants are invited to set up a display table at the community celebration. In 2013, the CIS Challenge awarded the first ever Community Spirit Award to Cowichan Women Against Violence to recognize the wonderful work that they do for our community.